A sci-fi-horror-action flick, directed by Luke Scott (in his directorial debut). The film was co-produced by Luke's father (Ridley Scott), and his production company (Scott Free Productions). It was written by Seth W. Owen. The movie stars Kate Mara, Anya Taylor-Joy (of 'THE WITCH' fame), Rose Leslie, Boyd Holbrook, Michelle Yeoh, Toby Jones, Jennifer Jason Leigh and Paul Giamatti. It tells the story of a highly skilled risk-assessment consultant, who must decide whether to terminate a very advanced artificial humanoid being. The movie has received mixed reviews from critics, and it's also bombing at the Box Office. I highly enjoyed it! 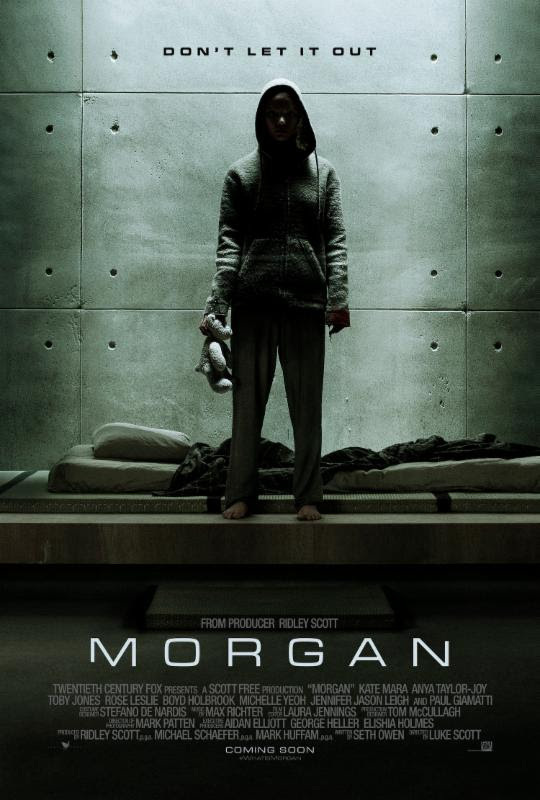 Morgan (Taylor-Joy) is an extremely advanced human hybrid; she looks and acts much like a normal human girl. She's highly emotionally unstable though, and she recently lashed out at a scientist (Leigh); by stabbing her (multiple times) in the eye with a pen. The company that funds the science experiment, hires a risk-management consultant, named Lee Weathers (Mara), to decide whether Morgan should be terminated. 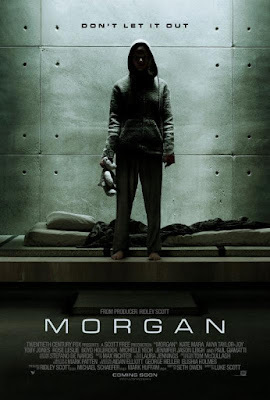 They send the specialist to the isolated location where Morgan's being held at, in order to decide whether the humanoid must be killed. Something goes terribly wrong. The movie definitely isn't the most high concept sci-fi thriller out there; it definitely doesn't rival Ridley's greatest films either (like 'BLADE RUNNER' or'PROMETHEUS'), but it's still a lot of fun! The action scenes are awesome, it's emotionally involving, and it's also extremely intense (as well)! Mara and Taylor-Joy are both excellent, in their female empowering leading roles; and you couldn't have asked for a cooler supporting cast (not for this type of low-budget B-movie thriller). I think it's a pretty impressive debut film for Luke Scott!